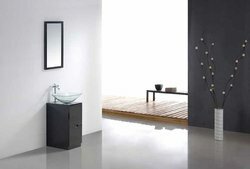 Romano Modern Bathroom Vanity Set - 17"
Name: Romano Modern Bathroom Vanity Set - 17"
Modern bathroom vanity set with a stylish solid wood cabinet and deep dish square vessel sink. Contemporary bathroom vanity design with chic Italian character. Whether remodeling a guest bathroom or powder bathroom, this modern vanity design offers plenty of storage and space saving without compromising on style or practicality. mirror wooden frame - mirror 17" x 0.7" x 30"